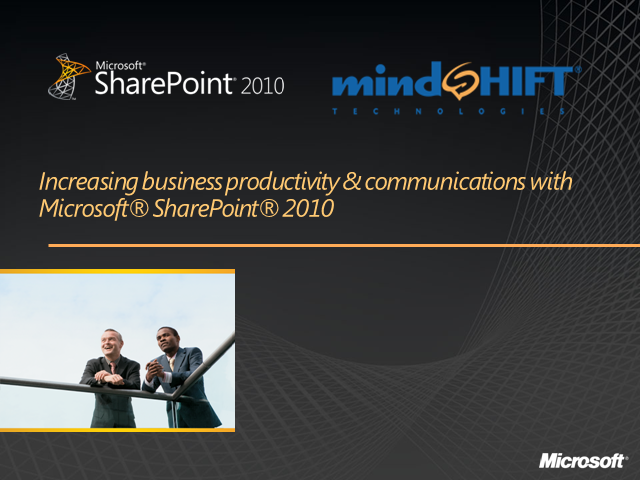 Learn how using SharePoint 2010 Foundation Server can help solve small and medium business productivity and communication challenges. Benefits and features of SharePoint Foundation Server and jumpstart SharePoint deployments with knowledge expert services. "IT" happens... Is your business disaster-ready? Now that 2010 is behind us, it is time to look at your disaster recovery plans for 2011, and re-evaluate. Disaster strikes when you least expect it, and planning for it is the first step towards minimizing the impact if it happens. To help you make sure you have the right business continuity plan in place to protect your critical infrastructure, we would like to invite you to our webinar, Disaster Recovery Planning for 2011.
mindSHIFT provides technology peace of mind to small and medium-sized organizations by delivering premier technology, cloud services and managed IT environment where leading technology resources and proactive management are available and affordable for organizations of all sizes - not just the largest corporations.